Thank you for this helpful information! I don't own a gypsy, but did not know the DSE files would not open in CCR. Now I know what to do and I thank you for taking the time to put this together for everyone! Interesting for those who use a gypsy,I have one but do not use it very much because it is too confusing and small for my eyes. I would love to know when we can have access to cartridges that are linked to a gypsy. I do have a question regarding transporting the files from the gypsy to the CCR. If it is designed on the Gypsy how can it be cut on the CCR? As you need to have the Carts linked in your CCR. Is it not true that once they are linked to your Gypsy they won't work in the CCR especially if you have used 2-3 different carts for your design? Hi Deb, Currently you can't cut using CCR from carts that you have linked to your Gyspy. PC are working on fixing that though. Our carts will be linked to our cricut.com account as opposed to our Gypsy. That way they can be used on both. In the mean time to cut files made with carts that are linked to your Gypsy you will have to have those carts available to insert into the Cricut. For carts that use multiple carts, CCR will prompt you to insert the carts. Once it has recognised you have them it will proceed to cut. Narelle, thank you for answering my question. I'll be glad when everything is synced together. I will do as you stated and see how it goes. Again, thank you! I have Design Studio but not a Gypsy....is there any way to import my .cut files into CCR without using a Gypsy? Not that I have found Amy. Importing them directly from DS (even after converting them into Gypsy files) doesn't work. The file imports, it even shows a preview, but when you open the file it is blank. Most of the time, I get 0KB for the files so I delete those. When it does appear that the files were copied from the Gypsy to my computer, I get an error msg from CCR "Error retrieving preview image". Any ideas? Thanks. I've been having that problem too lately Carolee. I've had to exit out of Cricut Sync (which removes the 0kb file) and try again. Sometimes several times. Very frustrating! 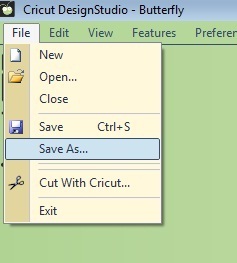 Instead of dragging the file over to your File Manager window, try using the Save As option in Cricut Sync. Highlight the file then right click. Select Save As then select where you want to save the file. I had some luck with that last night. I think it's maybe a connection speed issue. I'll keep testing it to see what I can come up with. I have trying to import a gypsy file to CCR. The file save as function on the gypsy appears to work...I have something greater than 0K but when I go to open the file on CCR there is nothing there. I then delete the files and try again. All of this because the CCR will not hide the contors for the wand part of the princess wand on Once Upon a Princess. It appears to hide the contor...but does not hide the verticle lines...even though I cannot see them. I wish Cricut's customer support was open on the weekends...I am at work during their working hours. Those lines on the wand are feature/tic lines and currently CCR can't hide them. It's on PC's list though. For the Gypsy file, if the whole file doesn't transfer to your computer (even if it's over 0k) it won't open properly. It's definitely finicky. I've had to do the process 3 or 4 times sometimes to get it to work. I make sure my anti-virus software is off when I'm transferring. I created a file on my Gypsy and hid all the extra lines (including the tic marks) and successfully imported it into CCR. It's currently cutting on my E2. If you continue to have trouble getting your Gypsy file into CCR let me know and I can create it for you. Just tell me what size you want it and whether you want any of the layers as well. I'm trying to import a downloaded gypsy cut file into DS. DS won't open the file, what if anything can I do? You're trying to import the Gypsy file into Design Studio? Or Cricut Craft Room? If it's Design Studio, are you getting an error message when you try to open the Gypsy file. If it's CCR, are you using the import function? And are you getting an error message? This is fustrating to say the least. I have had so many saved files and everytime i call provocraft for help the person tells me something completlty different. Do they know what they are doing do they actualy play with the cricut and the gypsy? I do not think so. All the projects i had saved are saved as a gypsy file do not know how to make a C:/Documents/Cricut/Projects file looked all over the computer can't find anything. So everything i manualy dragged over to a file are gypsy files and when I try to open them CCR it tells me error retrieving preview image. A CCR "welding" Challenge with a Great Prize!